I've just finished reading this new release by David Fitzpatrick. His story and experience was not an easy one to get through. 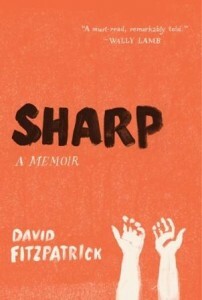 Sharp is a memoir of his life as a self-injurer. David was a cutter. And then more than that, he inflicted himself with pain beyond what most minds can comprehend. It's a rough life he walks us through, and I could feel for him at the same time I found myself yelling at him to STOP. I wasn't sure if I was sad, angry, hopeful, sympathetic ... his words walked us through so many stages of his life that the stages of emotion I experienced while reading easily fluctuated as much for me as a reader. David starts us off with a tremendous amount of history. Through those early pages I have to admit that I had a rough time sticking with him. There were various scenes where the amount of blood, the levels of pain, longing, hurt - there was just so much, almost too much for me to handle. I may have skimmed a few paragraphs as this isn't exactly light, before-bedtime reading. But I am glad that I did stick with David and his story. As a social worker I was completely intrigued by the way that David portrayed his psychiatrists. His doctors. His therapists. It is interesting to get into the mind of the patient and hear his thoughts on the approach taken with him to help him heal. While I've never worked with someone who has gone through what he has, I can begin to imagine the mindset of those professionals. And in that same breath, I can't imagine what it was like each time he relapsed. Each time he cried out. How does someone like that get help? He has to recognize the need. He has to agree that it is essential. Critical. REQUIRED. David walks us through his journey and we ache for him. With him. We also often want to throttle him. How hard is it to imagine ourselves, or anyone that we love, going through pain and repeating the same steps over and over? Sabotaging themselves. Ourselves. So many people go through it. The lucky. The strong. The few and the many. Those are the ones who get help. David got help and his story is ultimately a powerful one. If you are interested in the mind of someone who hurts themselves, in the history of a man who once inflicted so much pain on his own body, and in the way that he found his way home again - this story is for you. If you - yourself - have ever been someone who self-inflicts injury, or if you are currently experiencing these kinds of episodes, please reconsider reading at this time, until you speak with someone who can help support you along the way. There IS help. You deserve it. Don't let anyone, or yourself, tell you differently. David finally didn't. And help got him through. ** If you are in need of more support, please consider getting help. * I received a copy of this book to facilitate my review from TLC Book Tours. All expressed opinions are completely my own. What a powerful review! I can't imagine what life was like for the author before he got the help he needed. Oh Wow! This is one I don't think I'll be reading...not sure I could handle it this time of year, but you give a great review!